So it looks like the little Halloween game we made has been published on the intel appup store. So, I registered for the Samsung app store 'thingy' the other day. Samsung have a number of platforms themselves, not just one platform. Including Bada, Android, Tizen, and windows mobile 7. They have tablets, TVs, laptops, mobile phones... and probably other things too (maybe internet fridges?). It seems most of the platforms support web apps of some sort. Either through wrapping with phonegap (Bada, Android, win7) or just accepting an archive of the files. Once joined you can distribute free apps through there. Which is quite lovely really. They have their own advertising program, and I'm not sure if you're allowed to do In App purchases with them. 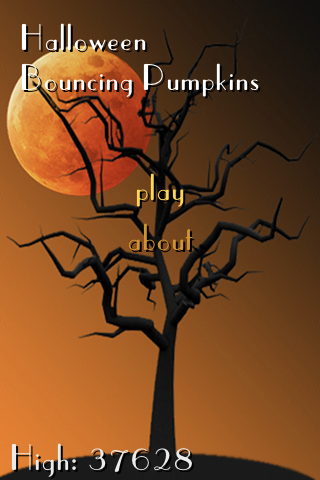 'Halloween Juggling Pumpkin' published to the chrome web store... I think. Well, I clicked the publish button, and it seems the 'Halloween Juggling Pumpkin' app has been published to the chrome web store. I'm quite happy that it is up! Here is a screen shot of the menu screen. Well, that wasn't too hard to do after all. Here is a screenshot of some game play. This was way less work compared to the intel appup store, which I'm still having issues publishing it. To be fair, their store is still in beta for html5 apps. Chrome Audio is worse than firefox, safari, and internet explorer Audio. There are cracks, pops, and sounds cut short. It seems there's also not many sounds that can be played at once. Signed my app with certificate, and submitted for validation again. So, I managed to sign my app and submit it for validation on the appup store. It took at bit of messing around, converting certificates, and installing lots of microsoft software, but eventually got my msi signed, and submitted to the store. That made me happy. Now I’m off to drink wine! Intel appup progress. Got certificate, looking forward to webkit upgrade. Well, some good news on the intel appup front. I finally managed to get my certificate, so I should be able to now sign my apps to upload. Unfortunately I used firefox to download the certificate, which means that I need to convert files in order to get into the microsoft fomat needed for code signing. So I’d recommend anyone else use IE8 to save that hassle. As well, I’ve been reporting my problems with the webkit they use in their forums. They just gotten back to me, and say they hope to use the latest webkit (which should include a year of webkit bug fixes and feature additions). So now, I’m going back to trying to submit my app again. I hope that it gets through! Applied for certificate, thinking about what to do next? I got an email back from Comodo about the code signing certificate, and now their form works. Then I had to submit my company certificate, and then have to wait for up to 2 days to get the certificate. I probably should have realised I needed this certificate before, and applied earlier. Oh well. For some reason I didn’t remember this was needed. Next I’ll begin packaging it up for the google web chrome store, so maybe we can sell some on there too. I don’t think that will take all that long to do. Well, I managed to prepare my app for submission to the intel appup store. I first had to figure out bugs: Sound doesn’t work. Also fonts don’t work. This was very disappointing considering that I’ve been working with a musician on sound effects and music. So we’re not able to use any of that work we did until they fix sound. I even tried to use a flash based sound player, and use the embed tag. None of it worked. Also the lovely font we selected does not work. Trying to use a font-face crashed the browser completely. So instead I had to use ‘Arial’. arg. I’m not sure what sort of html5 games and apps they expect if fonts and sounds aren’t working? It seems they are using a 1 year old webkit implementation, so I hope they will upgrade their encapsulator soon. One year in web browser years is about 70 human years. Anyway, we decided to submit the app anyway. The font makes it look a bit ugly, and without sounds it looses a lot – but at least the game play works. October came around, and I started working on a game. We got most of our new graphics and sound into the game today, and all of the game play is done. It’s not running fast enough on my ipod touch 2g, but I think with some work it could be playable. So we’re aiming to release on the various web stores first. Then perhaps improve things for the mobile platforms. I had to work on improving a sound engine I call jquery.shitsound, or just shitsound for short. Which uses various web browser sound APIs to work. I’ll have to get it using the phonegap framework to play audio too, since html5 Audio on mobile platforms is simply broken. We’re in, I should say. Since I’m doing a collaboration with Spencer Sternberg ( http://www.spencersternberg.com/ ) video game audio and music productions. This is what the pipeline looks like on the server side. Instead you can run it on the client side so you don't need a server for development. A webservice creates the json, and your server side jQuery scripts populate the html. Think of it as an industrial strength templating language that millions of front end developers know how to use.